I had been optimizing my collection for building EDH decks for a few years now, and this summer I was looking at my cards and realized what I had done: I had inadvertently build a Cube… for drafting Commander decks. 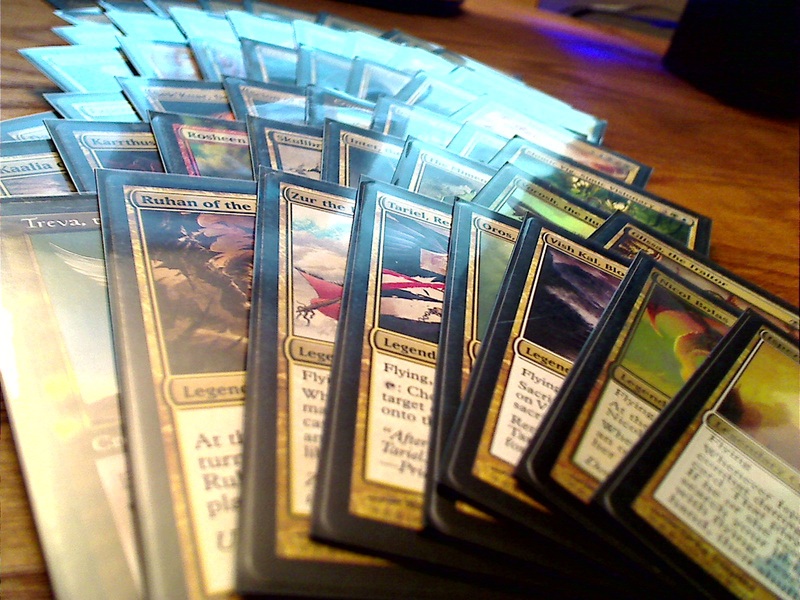 All I had left to do was collect a few more expensive cards, and sleeve it up! So, a little over a week ago I started testing the Commander Cube with a few friends over at Red Castle, and so far, all 15 or so people who have drafted it have loved it. I’ve even had a few friends tell me that “it’s more fun that a regular cube draft” and “I like Commander Cube more than normal EDH.” These comments showed it to be much more of a success than I had ever thought possible. I think the reason that the Commander Cube is so much fun to draft is because it’s uber-highlander, meaning that there are 896 unique cards in it. What this means for the format is quite simple: variety, which is something that I’ve notice some EDH games lacking lately. I have no idea how many times I’ve heard “I’ll Tooth and Nail entwined for Avenger of Zendikar and Primeval Titan.” While all three of those cards are in the Cube, you’d be super lucky to get all three of them, as opposed to some EDH games in which I’ve played where everyone had that in their deck. Give the cards back to Sam so we can do it again next week. I’m planning on sharing more details in the future. It’ll be a bit rough typing out the whole 840 cards in the cube, but for now I’ll give you all who are interested a list of the commanders. The first thing I did was to make sure that each color identity was covered by at least two Commanders, in some cases I was able to get three, but I wanted to limit the Commander pool to 56 so that in an 8-player draft, each person would end up with exactly 7 Commanders. There are also some number of mono-colored legendary creatures in the rest of the Cube, which may be used as Commanders, but it’s not recommended because it would be quite hard to draft enough cards in one color. Additionally, Commanders drafted, but not used as a Commander, may be included in the final build of the deck. I was also conscious of trying to include as many different deck archetypes as possible with the Commanders, and tried to have some overlap in archetypes as well. As of right now, I’m in the early stages of development/testing of the Cube, and 5c Commanders are still in there on a provisional basis. The next time I draft (hopefully this coming Monday) I’ll be hoping to pick a 5c Commander so that I can force 5c to see if it actually works (I’m expecting to be picking lands really highly). FIRST! Also its pretty fun. Looking through your list I noticed there is a color imbalance within your generals. For example you have 4 BR generals vs only 2 of each UW and GW. How did you adjust the rest of the list to balance that? When building my list I just decided to make 3 of each color identity, which ends up being 63 generals. I figure 56 will get drafted in the general section and the other’s will be added to the pool of normal drafted cards. So far this has been a fun project. It’s actually not that important to have an absolute color balance between all the generals. As long as you’ve got a decently balanced selection, the normal color selection forces that get exerted during the draft should keep the right cards flowing to who needs them. I’ve found that it’s a smart strategy to draft a couple of different first-choice commanders and then let what kinds of cards that get passed to you in the draft decide who you play. You might not play exactly who your first choice is, but your deck comes out the stronger for it. I live in Portland, and I play EDH, and I have a standard cube, and I’ve been wanting to try a commander cube. I would love to play with you some time. Is there an email contact on this site? I am confused. If you only end up with 112 cards, to make a 99 card deck, you need to use almost every card you drafted. Is it really feasible that no single player drafts more than 13 “last picks” and unplayable cards in a set? What if you don’t end up with 99 playables? Well, Virtual Alex, it’s a lot like regular drafting. In a typical m12 draft, for example, players draft just 3 packs of 15 cards, yet they make 40 card decks out of just 45 cards they drafted! Virtual Alex, hopefully by now you’ve played it or become less confused. But for others with the same question, don’t forget the fact that you need to add basic lands for deck construction. Usually around 36-40 is a good number. You’ll usually have around 60 playables from your draft and the rest divided among basic and non-basics. Do you allow players to use any of the 7 drafted legendary generals in their decks? For example: I draft both Nin and Niv. I choose Niv as my general can I use Nin in my deck? Do they have to be resleeved? Nah, if you draft them, you can use them, and they’re all in the same sleeve, so no need to resleeve.